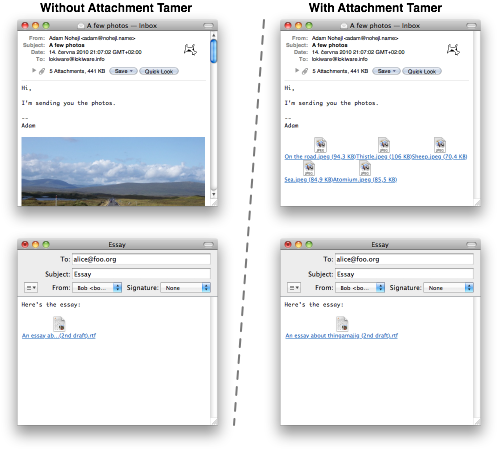 Take control of email attachments on Mac! After 10 years of continued work on Attachment Tamer and over a year of, admittedly, not being able to keep up with Apple's sped up release cycle and increasing technical difficulties of Mail plug-in development, I decided to find a better way forward for both my customers and myself. I am preparing a solution for handling attachments in current and future OS X releases, that would be up to the standard set by previous Attachment Tamer releases, in a partnership with well-known Mac developers. As the holiday season has slowed us down, I am going announce more details early in the new year. PS: If you are repeatedly getting a message about Attachment Tamer being disabled on OS X Yosemite, you can use the latest pre-release installer to remove it. Feel free to download and try Attachment Tamer before buying, or browse the online help for more information. This plug-in requires at least Mac OS X 10.6 “Snow Leopard” and is fully compatible with more recent releases including OS X 10.8 “Mountain Lion”. If you use Mac OS X 10.5.x “Leopard” or 10.4.x “Tiger” and cannot install the current version because of that, download instead this older version for Leopard or this one for Tiger. Note, however, that no more updates for Mac OS X 10.4.x or 10.5.x will be released. The outdated downloads are provided only as a temporary solution for those who cannot upgrade to a more recent release of Mac OS X and they are no longer supported. A free registration code for the Leopard version is included in the download, for the older Tiger version it is: 8A419E1A. Looking for Mail Attachments Iconizer? 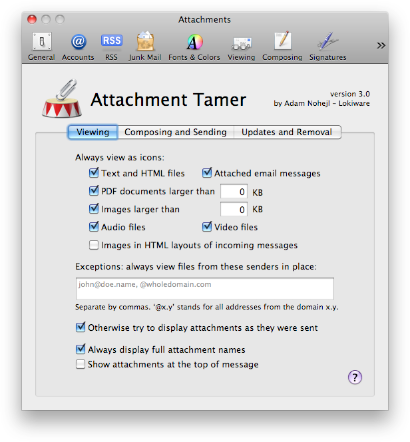 The software you have known as Mail Attachments Iconizer is now called Attachment Tamer. If you are a registered user of Iconizer, Attachment Tamer is fully covered by your license: you can download it as a free update. Thank you for your support! Pre-release build for OS X Mavericks: compatibility with the OS X 10.9.5 (Mail 7.3 and Message 7.3) and new Apple security requirements to the same extent as previous pre-release builds. Attachment Tamer currently does not support OS X Yosemite, so licenses are not available for purchase. I will provide more information soon. Thank you for your patience! Browse the online help, retrieve a lost registration code, or contact me: . Letter Opener converts Microsoft Outlook's winmail.dat files on the fly, so you can actually see and use what the sender intended you to have. Here's a handlist of plug-ins from other developers devoted to enhancing your email experience!